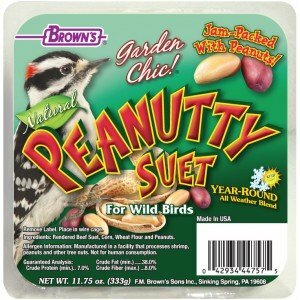 Brown’s® Garden Chic!® Peanutty Suet Cakes are a favorite of woodpeckers, cardinals, and other songbirds. They’re made with pure, fresh suet blended with millet, sunflower seeds, and jam-packed with peanuts, making them ideal for year-round feeding. Peanutty Suet Cakes fit into our easy-to-use wire feeding baskets to provide the fat and energy birds need to survive the hard winter months and nest in the spring.. Rendered Beef Suet, Milo, Wheat, Millet, Sunflower Seeds, and Peanuts.